Indian weightlifter from Andhra Pradesh. She became the First Indian woman ever to win an Olympic medal. She won bronze in 69kg category at Sydney Olympics 2000. She has also won gold in Istanbul World Championship (1994) and Asian Championships (54-kg category) at Pusan, Korea (1995). 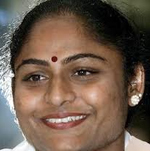 In World Weightlifting Championship at Guangzhou (China) on November 19, 1995 Malleswari set a new world record by winning three golds in 54-kg category. She was awarded 'Rajiv Gandhi Khel Ratna Award' in 1994-95.